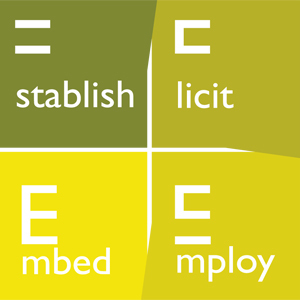 Working towards: Sustainable fuel; sustainable jobs; better communities. We’ve got reports of hugely successful events from Kenya and Sudan coming in and the Systems Jam at in London produced some excellent results. We’ll post up pictures and more detailed reports, as soon as possible. 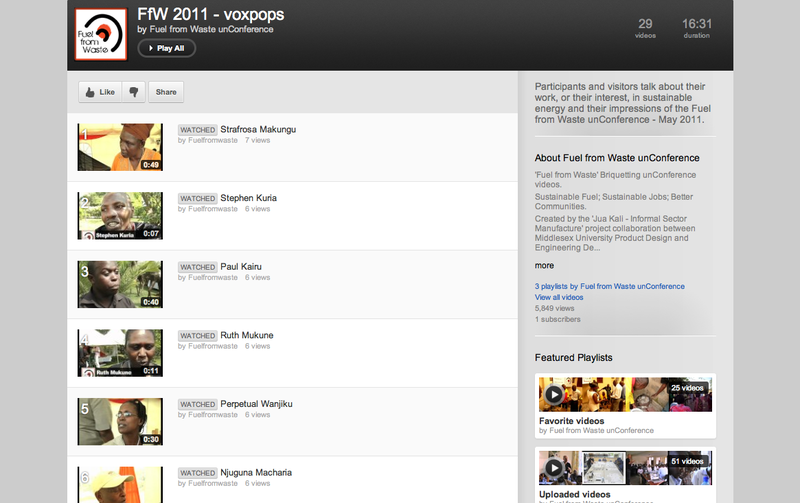 We’ve put together the footage of FfW 2011 into three playlists on youtube.com to help support World Fuel from Waste Day 2012. Hopefully they will be helpful and understanding the area, the approach and the people involved, and will encourage others to link up with the movement. Another event being run by Isaiah Maobe of Steam Brqiuettes today will be taking place in Kisumu, Western Kenya. This will be a briquetting demonstration fair. Wanyjok town council, in Awiel East county NBeG will be working with the group and inviting local CBO/CSOs to join the event to introduce briquette, and adapt production to support their waste management strategy. The Sudan event adds to the 5 events around Kenya and 1 in London. 1. The YUPO (Young Potential) Club, associated with the ‘White Charcoal’ Group in Dandora, will be running briquetting demonstrations and training. The event will be held in Dandora. 2. The Recovery and Hope Ministeries will be running briquetting demonstrations and training. The event will be held in Ongata Rongai. 3. Community Action for Nature-Githunguri – CAN G (a program under the Youths Climate Change Adaptation Network) will be running an event focusing on biogas. They will be demonstrating the techniques used in generating biogas from the school’s toilets and those used by local farmers who are using biogas generated from cow dung. The event will be held at – Mama Ngina Primary School, Kinoo, Westlands. 4. Seminars, demonstrations and training of briquetting and stove production techniques and machinery in Nairobi. 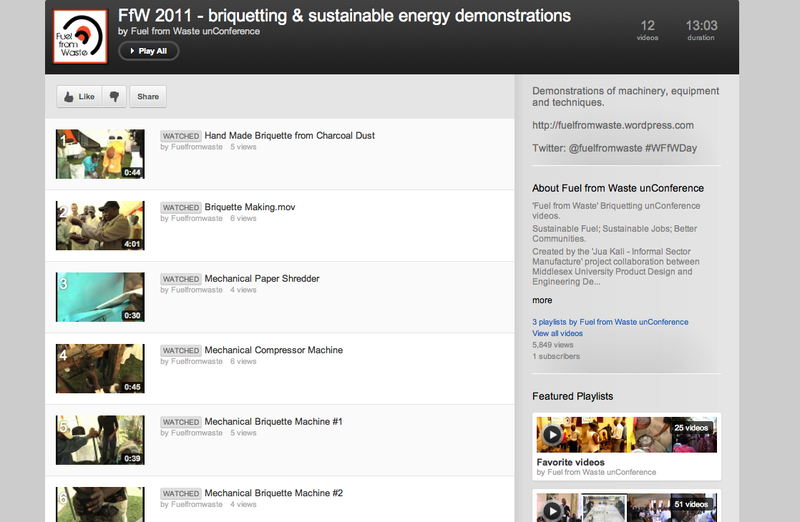 Consisting of video shows of the Alfastar Development Association and Fuel from Waste work, couple with live demonstrations of motorized and piston manual presses, and a range of stoves. 5. Seminars, demonstrations and training of briquetting and stove production techniques and machinery in Limuru. The Alfastar Development Association will facilitate both events. 6. A ‘Systems Jam’ – live development (through service ecology mapping) of new ways to link up technology (eg mobile banking, mobile apps, sms text services, solar systems, more) with community and individual briquette/sustainable energy initiatives and businesses. Using the experience of the redLoop team, invited experts and Design students to generate ideas through service ecology mapping, to help expand and extend empowerment and community development, through sustainable energy, to more people. Get in contact if you want to join in with existing events. Or, you can set up your own. This could be as small as a briquetting or solar experiment in your home or school; a planting event in your community; a local waste gathering and sorting session; a creative concepting session in your studio – or many more – be creative and let us know. Workshop at DIS 2012, Newcastle upon Tyne, UK. The team from redLoop Design who organised and facilitated the unConference, with Terra Nuova East Africa, wrote-up their approach and proposed a new methodology for condensed time-period Participatory Design. We are very excited to announce a new event in Southern Sudan, with multiple groups taking part. We now have 6 confirmed events – 5 around Kenya and 1 in London. More to be confirmed, soon. We have 4 confirmed events – 3 around Kenya and 1 in London – so far, with more to be confirmed, soon. 1. Community Action for Nature-Githunguri – CAN G (a program under the Youths Climate Change Adaptation Network) will be running an event focusing on biogas. They will be demonstrating the techniques used in generating biogas from the school’s toilets and those used by local farmers who are using biogas generated from cow dung. 2. Seminars, demonstrations and training of briquetting and stove production techniques and machinery in Nairobi. 3. Seminars, demonstrations and training of briquetting and stove production techniques and machinery in Limuru. 4. A ‘Systems Jam’ – live development (through service ecology mapping) of new ways to link up technology (eg mobile banking, mobile apps, sms text services, solar systems, more) with community and individual briquette/sustainable energy initiatives and businesses.